Everyone who wants to buy a 3D printer has to make this choice! The single extruder or Dual? And of course you may have decided to go with dual head and that’s why you are here. Well, let’s take a look at Why should anyone opt for dual extrusion? With single extruder, the result is very monotonous. There are often beautiful objects that can be printed using 3D printers, but a monotonous color makes it really dull. Here comes dual extruder to the rescue! By varying colors, you can make a lot of combinations. In some cases, it is necessary to work with support material. In a dual extruder, a soluble material can be used as a support material and it is a lot faster and smoother than using single screw extruder. You can use different materials in the same object. For example a wooden sculpture with plastic base. In some cases, the printing will be faster than a single extruder print. You can get dual extruder 3D printers by spending a few more bucks than single heads. So we list the best dual extruder 3D printer for home and commercial use. Flash Forge, a Chinese manufacturer producing 3D printers, filaments, and accessories since 2011 has made great strides in recent years. With a monthly production of 5,000 3D printers, they are among the top 5 3D printer manufacturers. 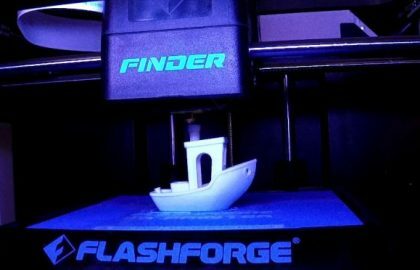 Flash Forge focuses more on the entry-level and middle-class segment of 3D printer market and with outlets in 36 different countries, both the brand and the customer base is growing quickly. The Flash Forge Creator Pro is referred to as a duplicate because the device is very similar to the MakerBot Replicator 2X. But that’s not bad if you get it for nearly half the price of Replicator. Right? Flash Forge Creator Pro comes with 2 rolls standard filament, although you can start printing right away, our experience so far is that the included roles are almost always of very poor quality. Because of that, your first printing quality might not be that great. It is advisable to always use a premium filament, you’ll see that the print quality is much improved. The Creator Pro has an LCD screen on the front with a keypad, uses the firmware Sailfish, one of the most used firmware in the 3D printing industry. The build area of the Creator Pro is 227x148x150 mm (length/width/height) which is pretty average only.Flash Forge Creator Pro has a full metal body making it a solid device; the building platform is made of aluminum which is a hefty improvement over glass because it is a lot better and durable with repeated heating of the building platform. It also gives better construction with ABS filament. Despite the low price, the print quality is extremely good making this the best low-cost dual extruder 3D printer in the current market. The printing resolution is also average (0.1 mm to 0.5 mm) but a significant advantage is the open source design. Slicer software like ReplicatorG (supplied as standard) Cura and Simplify3D ensure a noteworthy improvement in print quality. 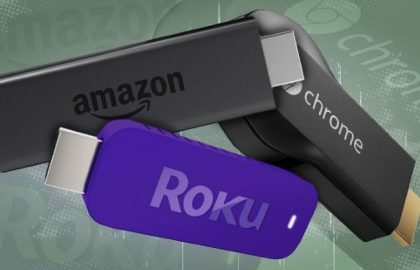 You can connect the device via USB to a computer but it is also possible to print stand-alone using an SD card. The Creator Pro can handle most of the filaments like PLA, ABS, PVA, Nylon etc. The Creator Pro is a stable and robust machine with good print quality at an attractive price. The fact that the printer is almost entirely based on the MakerBot Replicator 2X, a much more expensive 3D printer with a good track record makes it more problem-free. We highly recommend this printer especially to hobbyists, consumers and small businesses. Schools and organizations with a limited budget can use this 3D printer. QIDI Tech 3D printer is practically an equivalent 3D printer to the FlashForge Creator Pro but priced less than that. Both are also based on the MakerBot Replicator 2X. 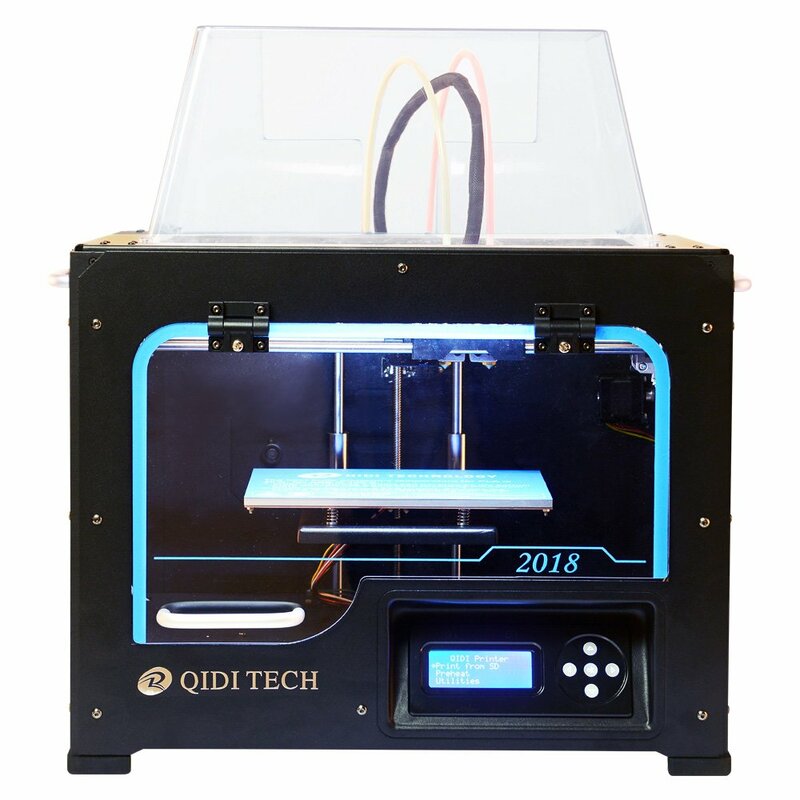 Whether a novice hobbyist or an experienced engineer, the QIDI Tech device is a 3D printer worth looking at. 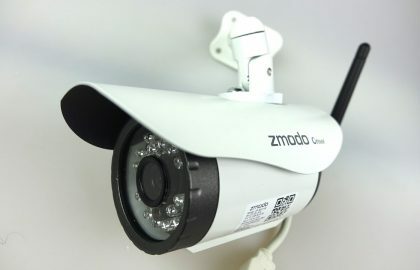 The company introduces a more economical model with a number of attractive features, optional upgrades, and excellent customer support to capture the market. The sturdy QIDI Tech has a metal frame and weighs almost 46 pounds. It measures 18.3 x 12.6 x 14.76 inches and features a heated printer bed that creates objects up to 9 x 5.9 x 5.9 inches with an overall print volume of 313 cubic inches or five liters. The plate is constructed from aviation grade aluminum, which prevents warping from the high temperature up to 120F. The assembly is straightforward and simple due to the easy-to-follow instructions on the SD card. Some find that the YouTube videos are also quite helpful for learning to get started. Mount the dual extruder into the cradle, mount the filament holders, the filament, and attach the plexiglass top, walls and door. 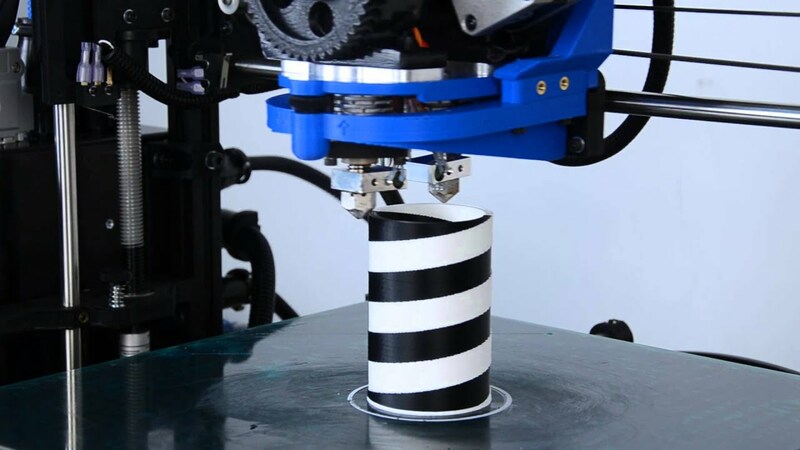 The dual extruders enable multi-color printing in layer thicknesses that adjust from 0.1 to 0.3 millimeters. 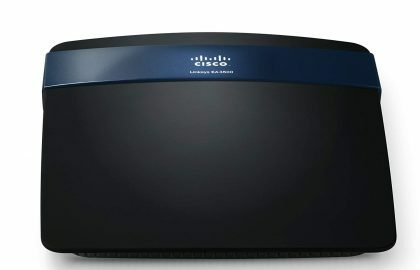 The machine functions either via the PC tether or the SD card. Later upgrades may include wireless function. The printer needs occasional recalibrating between builds which is an inconvenience. The QIDI Tech 3D printer does not have the option of an extended warranty. However, they have an excellent customer support team to ensure customer satisfaction. Staff members are known to respond quickly to emails and provide answers to questions, guidance and a wealth of helpful tips. Replacement parts also tend to arrive faster than expected. Even cheaper model than Creator Pro, with a lot of features and good performance. Trust me you can count on QIDI Tech. MakerBot has released a series of 3D printers, and the fourth-generation Replicator 2 continues to be one of their most successful models. With a more industrial look (steel frame and LCD screen), the Replicator 2 would fit perfectly into a garage. It’s larger than most others, with an excellent build volume of 285 x 153 x 155 mm – just make sure you have room for it. This FDM 3D printer supports printing from an SD card and prints mainly on PLA. 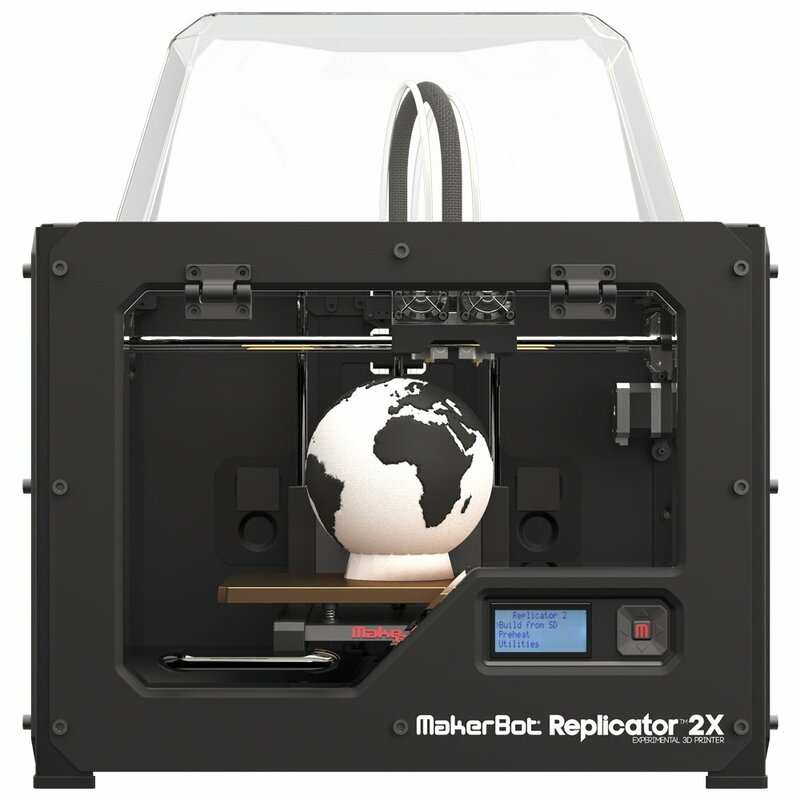 It is really a durable machine; unlike some of the fragile 3D printers on the market, the Replicator 2 is known for its reliability and manufacturing quality. It’s accurate, easy to use and has good software. While examining the disadvantages of this printer we should say that there is no heated platform and it is a noisy model. It’s also expensive and is better suited for intermediate users who want a machine that will test the limit. Very expensive. Suitable for commercial purposes. LeapFrog is a well-known Dutch manufacturer in the 3D Printer market. Their latest model, the Leapfrog Creatr is a high-quality printer. Made of aluminum parts, this is extremely durable too. This 3D printer is available with the single or dual extruder (simultaneously print in multiple colors) and can handle different materials like ABS, PLA, and PVA. The machine has a build area of 230 x 270 x 200 mm heated surface and print resolution up to 0.05mm which is fairly good considering the price. You can connect to the computer via USB 2.0 interface only. Sadly, there is no wireless option available till. You will get 3 types of filaments and 2 software with the package. Leapfrog claims that the printer can be installed within half an hour and you are ready to print. The printer comes fully assembled and calibrated and has two software programs that convert your files to 3D print files which Creatr can handle. However, from our experience, this software is not super user-friendly and can be too complicated at times. LeapFrog has really done their best to bring a durable, quality product to market with the Creatr series. In addition, you can choose for single or dual extruders. If we compare price with the quality of this 3D printer, the Leapfrog Creatr is an excellent product. The LeapFrog Creatr HS is the latest 3D printer and successor of the well-received LeapFrog Creatr. HS, or High Speed, is an update of the existing LeapFrog Creatr and has some advantages over its predecessor. The new 3D printer is equipped with a double extruder and an LCD screen that allows users to operate the device easily. Build quality, however, remains same for both the versions. The biggest advantage of the latest version is the printer is, as the name suggests, printing at high speeds (up to 300mm/s). Like the ordinary LeapFrog Creatr the Creatr HS can handle multiple materials. The device uses 1.75 mm filament and can print with materials such as ABS, PLA, HIPS, PET and Nylon. Another advantage is that Leapfrog provides a standard version of Simplify3D, making it very user-friendly. LeapFrog Creatr HS has a build area of 290 x 270 x 180 mm (slightly larger than Creatr) and a print resolution up to 0.1mm. Connectivity options include USB v2.0 and USB memory stick. Competing with the biggest players like Makerbot and Ultimaker, LeapFrog has done a fairly good job creating high quality and durable 3D printer with the bundle of features at a decent price. We can surely expect to see more of their products in the near future. The Robox 3D Printer from the British company CEL has everything that a modern, user-friendly 3D printer should have. It has a very futuristic look and very durable construction. CEL brings us many innovative features through the Robex. 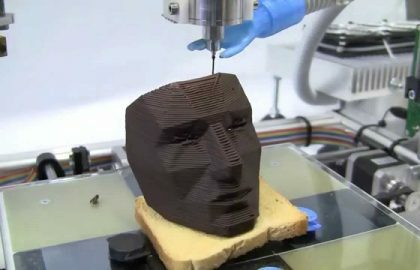 For example, the print head can be picked up; this would lead to many new opportunities for this device in the future. Likewise, Robox also uses a specially developed filament conductor by the company. This not only ensures that the filament goes to the extruder at the proper speed, but can also feed the material at accurate volume. The nozzle valve system created by CEL cuts off filament completely, eliminating ooze and contributing to a much smoother surface finish – meaning less time spent on finishing work. The Robox 3D printer automatically recognizes any filament loaded and self-adjusts the temperature in there. The Robox 3D Printer uses specially developed slicer software which has a very user-friendly design and makes it easy for anyone to print a 3D model. Although this device has dual extruders it does not mean that you can print multiple materials or colors. Firstly, only one filament can be loaded at a time into the device and secondly the second print head can be used only to support material and to fill the model. This makes the device print a lot faster. CEL Robox also has the highest print resolution of 0.02mm but has a build area of only 210 x 150 x 100 mm which is pretty disappointing. Felix 3.0 is the latest model from the Dutch manufacturer Felix Robotics (Not that popular in the U.S.A). There are also suppliers who deliver assembled versions of these 3D printers. Felix 3.0 has the better build quality and print speeds over its predecessor. In addition, you can choose for the dual extruder, which makes it possible to print with several materials or colors at the same time. If you choose dual extrusion, the construction area will be limited. Felix 3.0 is a very good quality product and has high precision. The single extruder model has a nice large heated build platform of 255 x 205 x 235 mm and can handle 1.75 mm filament. The printer supports standard ABS and PLA, but it is possible to print with other materials too. Felix 3D printers are a fully open source which means that you can use any kind of software with this printer. 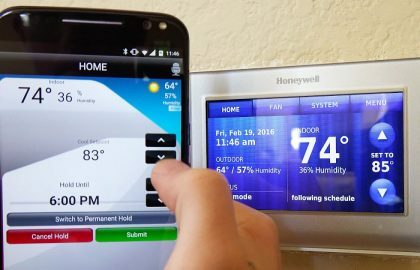 Another advantage is that it is possible to upgrade the device later when new components are available. It supports SD card as well as USB connectivity.